What a year it has been for the World GP Bike Legends heading to some of the greatest circuits including Silverstone UK, Estoril Portugal and Monaco. 2018 saw another fantastic line up of riders with some youngsters in the mix stirring up the battle for the podium in The Race of Legends. 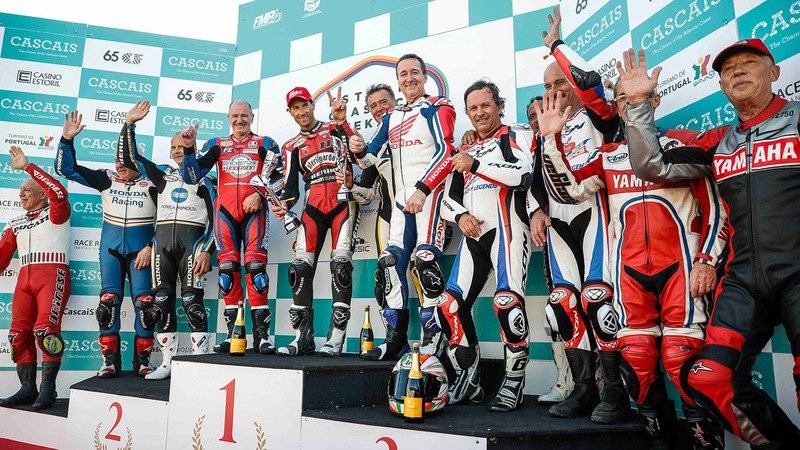 The Estoril Classic 2018 weekend was graced with perfect weather in Portugal and the World GP Bike Legends were there to impress, inspire and entertain for their fourth year at the event. With appearances from Legends Phil Read, Freddie Spencer, Wayne Gardner, Steve Baker & Raymond Roche fans were in for the ride of their life: with 13 world titles between them, these men of steel rode to win. These World Champions were joined by Pierfrancesco Chili, Ruber Xaus, Niall MacKenzie, Niggi Schmassmann, Jurgen van den Goorbergh, Jose David de Gea , Luis Jose Maurel, representing the worldwide talent from the glory days of racing. Also live on track and on home turf was Alexandre Laranjeira and Hermano Sobral flying the flag for their home fans. Great reunions took place and even greater rivalries were reignited before the team took to the track to show off some of the best machinery from both the modern and vintage eras. Our first visit to the Estoril Classic saw our Legend riders and bikes wow a whole new audience with the speed, sound and daring that the World GP Bike Legends are renowned for. Off track did not disappoint with many meet and greet session for the fans. A great weekend and the Legends all enjoyed the Portugese hospitality and sun. The Silverstone Classic 2018 weekend dawned hot and hazy in Northamptonshire, England and World GP Bike Legends were there to impress, inspire and entertain for their fourth year at the event. Partnering with both Yamaha and Honda at this year’s event, the World GP Bike Legends were delighted to be able to showcase the Yamaha R1, Honda CBR model in a superb display by the manufacturers both on and off the track with a late entry from Triumph’s Speed Triple. In a stunning showcase of some of the most beautiful looking and sounding, the World GP Bike legends fans were treated to the rare sight of these bikes blasting around the Silverstone circuit. A true sight to behold. Fans went wild at the sight, sound and smell of the iconic 1976 Suzuki RG500 as they heard the deafening roar of the two-stroke machine being ridden by 7-time World Champion Phil Read. Fans were able to get up close and personal with the renowned bikes and the legend riders: autograph sessions, book signings by both Steve Parrish, Freddie Spencer and Phil Reid with photo opportunities abounded to provide the visitors to Silverstone the traditional biker welcome. The Silverstone Classic is the largest classic motor racing festival in the world, enticing over 100,000 fans to the circuit over the July weekend. World GP Bike Legends were delighted to attend the Grand Prix de Monaco Historique, organised by the Automobile Club de Monaco in May 2018 bringing bringing all the glitz and glamour of the motor racing of yesteryear back to life for a packed weekend. After the only Grand Prix Moto ever raced in Monaco in 1948, The Automobile Club de Monaco invited the Motos et Scooters Anciens Club of Roquebrune Cap Martin in 2018 to help celebrate the 70th anniversary of the event. World GP Bike Legends lead the parade with riders Wayne Gardner, Raymond Roche and Virginio Ferrari and honoured to share in this historic moment. The revered Monaco track is still close to the original design of the 1929 track, providing an awesome backdrop for a fun filled weekend with over 180 Grand Prix cars taking to the track alongside the Legends and their fellow Parade riders. The weekend saw daily parades lead by our Legends, delighting the crowd with their machines over the 3 Day Historic Grand Prix weekend.